We are not huge fans of social networks and communicating in cyberspace finding face to face contact far more preferable. Indeed we find mobile phones deeply intrusive, intensely irritating and not to say downright rude when given priority by their owners over those who have made the effort to be physically present with them. But hey-ho our view is "if you can't beat them join them" and there is no doubt that cyberspace communication has its benefits. I recently reconnected with a friend from my days in Dublin and with whom I had lost contact when I moved to London well over twenty years ago. Thanks to the wizardry of Mark Zuckerberg and his mates we are now in touch again and find we still have much in common. He is now married to a Catalan partner and living just outside Barcelona. Need I say that he too loves his food. That's more than enough for me, we have reignited a friendship and I am very pleased about it. Last week he was attending a course nearby and we planned to have dinner at my flat one evening. I wanted to show him a picture album I still had and in which he figured prominently... Ooooo believe it or not we were once the bright young things in town! I decided on this easy one much of which could be done in advance leaving me free to chat and giggle over old photographs. 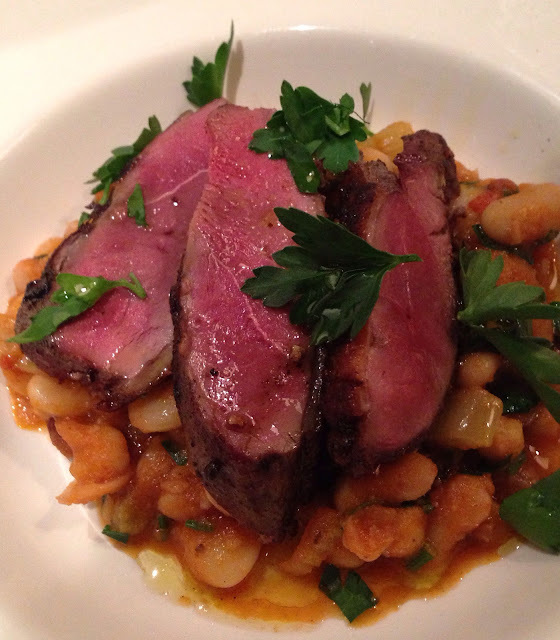 Seared ducked breasts with mixed beans and chorizo. Place the ingredients for the dry marinade in a coffee grinder or blender and reduce to powder. Score the fat layer on each of the breasts into diamond shapes and rub in the powder. Leave for a few hours or overnight in a sealed container in the fridge. Place the breasts on a cold pan and slowly bring up the heat melting much of the fat away. (approx 4 minutes) When nicely browned and crisp turn over and leave for a further 2 minutes. This will result in rare meat but you can adjust the length of cooking to taste. Meanwhile slice the chorizo fairly thinly and place in a separate pre-heated pan. Add the onion, celery, parsley stems, garlic and Paprika and cook until translucent. Add the red wine, Tabasco and Worcester sauces and chicken stock and simmer for a few minutes until stock reduces. Finally rinse the beans and add to the liquid. Season to taste. This can all be done well in advance. (Indeed its better if you do!) The duck breasts can be heated gently under tin foil in the oven. Slice diagonally and serve on top of the mixed beans with a garnish of fresh green parsley leaves.